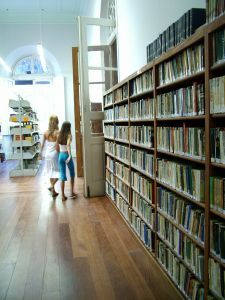 If you're looking for literature for homeschooling, then Homeschool Library Builder is a place you should visit. This is a free site where you can find books that go along with various literature based curriculums like Ambleside Online, Five in a Row, Sonlight, Beautiful Feet, Veritas Press, Tapestry of Grace and others. Or maybe you just like good literature to use on your own for homeschooling. 1. Discount books - Most of the books I looked at were anywhere from 24-50% off. 2. Out of print books - Some of the above mentioned curriculums use out of print books that are very hard to find. You have a good chance of finding those out of print books at this site because books are their specialty and they know what homeschoolers are looking for. 3. Good Search capabilities - At HSLB you can search 32 categories of books and sort them by product and price. 4. Frequent buyer program - You earn $1 for every $15 you spend. This is a great way to save money on homeschooling. You have to purchase the books anyways. You might as well get a little back in the process. They have a good referral program too. If you tell your friends about them, you can get even more to spend at their site. 5. Marketplace for those with home businesses - If you have a home business you could be featured on the HSLB monthly newsletter and get exposure for your business. If you don't have a home business, this is still a great resource to use to help support other homeschool moms. Disadvantages - I don't see any unless you don't want to build a homeschool library. Have fun! This is a great literature resource for any homeschooler. I thought we had read just about all the literature that is out there for homeschooling, but Homeschool Library Builder has so much more available.